View this sample resume for an operations manager, or download the operations manager resume template in Word. To be a successful candidate for the leading operations manager jobs, your resume will require some oversight, says resume expert Kim Isaacs. Not only will hiring managers want to see the kinds of skills and experience you have under your belt, but they'll also want you to demonstrate the value you'd bring to a company. 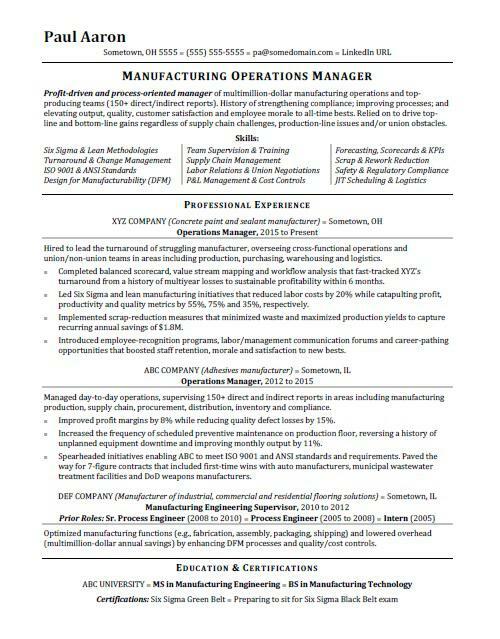 For writing tips, view this sample resume for an operations manager that Isaacs created below, or download the operations manager resume template in Word. According to the Bureau of Labor Statistics (BLS), you'll find the highest level of employment for this job in the following states: California, Texas, New York, Illinois, and Florida; and in the following metropolitan areas: New York City, Chicago, Los Angeles, Atlanta, and Washington D.C.
As an operations manager, you can expect to earn a median wage of $100,410 per year, or $48.27 per hour, according to the BLS. Additionally, you can search for operations manager jobs on Monster. Profit-driven and process-oriented manager of multimillion-dollar manufacturing operations and top-producing teams (150+ direct/indirect reports). History of strengthening compliance; improving processes; and elevating output, quality, customer satisfaction and employee morale to all-time bests. Relied on to drive top-line and bottom-line gains regardless of supply chain challenges, production-line issues and/or union obstacles. Hired to lead the turnaround of struggling manufacturer, overseeing cross-functional operations and union/non-union teams in areas including production, purchasing, warehousing and logistics. Completed balanced scorecard, value stream mapping and workflow analysis that fast-tracked XYZ’s turnaround from a history of multiyear losses to sustainable profitability within 6 months. Led Six Sigma and lean manufacturing initiatives that reduced labor costs by 20% while catapulting profit, productivity and quality metrics by 55%, 75% and 35%, respectively. Implemented scrap-reduction measures that minimized waste and maximized production yields to capture recurring annual savings of $1.8M. Introduced employee-recognition programs, labor/management communication forums and career-pathing opportunities that boosted staff retention, morale and satisfaction to new bests. Managed day-to-day operations, supervising 150+ direct and indirect reports in areas including manufacturing production, supply chain, procurement, distribution, inventory and compliance. Improved profit margins by 8% while reducing quality defect losses by 15%. Increased the frequency of scheduled preventive maintenance on production floor, reversing a history of unplanned equipment downtime and improving monthly output by 11%. Spearheaded initiatives enabling ABC to meet ISO 9001 and ANSI standards and requirements. Paved the way for 7-figure contracts that included first-time wins with auto manufacturers, municipal wastewater treatment facilities and DoD weapons manufacturers. Optimized manufacturing functions (e.g., fabrication, assembly, packaging, shipping) and lowered overhead (multimillion-dollar annual savings) by enhancing DFM processes and quality/cost controls. As an operations manager, you are used to multitasking. Your resume should follow your lead; it has to demonstrate your skills and experience, as well as show what kind of value you'd add to a company. Not sure yours is able to pull that off just yet? Get a free resume evaluation today from the experts at Monster's Resume Writing Service. You'll get detailed feedback in two business days, including a review of your resume's appearance and content, and a prediction of a recruiter's first impression. The experts at Monster can help you put your best foot forward on your way to a great new job.